Former energy and power development minister Samuel Undenge, left. 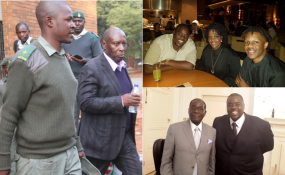 and Harare businessman Wicknell Chivayo with the Mugabes. Contractors for Zimbabwe Power Company (ZPC)'s 300 megawatt Gwanda solar farm have completed and submitted to the power utility the geo-technical survey report for the project, in a development insiders say extinguishes ZPC's outstanding financial exposure. The geo-technical survey, carried out by Tailjet Consultancy at a cost of $656 000, forms part of pre-commencement works, which ZPC had paid $5,1 million for in advance. The completion and submission of the report sets the stage for the start of phased construction of the plant. The solar project will be implemented in modular phases, starting with 26,1MW, which allows for expedited implementation, cost and quality optimisation. The report comes after a feasibility study and environmental impact assessment (EIA) report were completed and submitted to ZPC. Shanghai Power Design Institute conducted the feasibility study, which confirmed that it was possible to build a solar power plant at the locality. The geo-tech survey comes as ZPC prepares to host a delegation from CHiNT Electric, the foreign technical partner in the long standing Gwanda solar project. Parties to the deal will discuss the Chinese firm's pledge to advance a $52 million payment guarantee for the solar farm project. They will also deliberate on issues that have stalled the project as well as find solutions to avoid further delays to the Gwanda solar project. A geo-technical survey is the first step in the construction or consolidation of a site. It includes information about soil consistency and structure, groundwater level and recommendations for the technical project. For Gwanda, it confirmed that a solar power farm could be built on the identified site. It also confirmed that there were no minerals, which may require that the solar project be moved to pave way for such commercial activity. A solar farm may have a lifespan of up to 40 years, as such, it must not be built on land that has other significant commercial purpose. The submission of the geo-tech report comes after President Mnangagwa expressed reservations after touring 2,5MW Nyangani Renewable Energy in Mutoko recently over delays on the Gwanda project, which has taken three years to start since being awarded. The contract for the solar project was awarded to local firm Intratrek Zimbabwe and its Chinese technical partner, CHiNT Electric, which have been battling to secure funding for the project. The tender was awarded at an engineering procurement and construction (EPC) cost of $172 million. The contractors have since agreed to reduce the EPC cost to $140 million on account of falling cost of installing solar power plants across the world. Following the submission of the geo-tech survey report by the contractors, sources within ZPC said the State power utility would now be obligated to release an additional $1,5 million, including value added tax for completion of remaining pre-commencement works.